Wood plastic composite, a new environmental protection material, along with the rapid development in recent years, the demand for wpc is continued growth, more and more people use for outdoor. Today we introduce environmental protection wood plastic composite product. As we all knows, wood plastic composite is an environment-friendly renewable resources. Because of this, it will become the future development trend of the outdoor landscape, to be other non-renewable resources substitute product. Wood plastic composite materials are often confused by customers, some people think that the wpc floor is plastic floor, so think of plastic used in outdoor will appear some problems, such as fading, variant, cracking and so on, of course, poor quality wood plastic composite flooring will have plastic flooring above the problem, but the Seven Trust plastic wood is a set of HDPE (high density, good mechanical properties of PE) and wood powder and antioxidants, UV absorbers and other raw materials In the whole, so it durable, long life and will not crack over time. 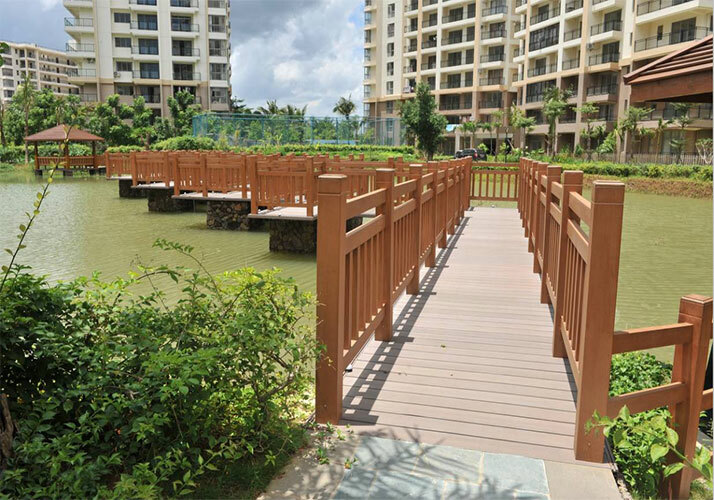 Many places need to use environmental protection wood plastic composite decking, such as swimming pool, seaside, dock, outdoor ect, because wpc contains plastic ingredients, so it is waterproof, so it can completely replace the waterproof board, of course, it can also be used in the interior of the bathroom, but in the bathroom is generally recommended, DIY wood plastic composite decking, with beautiful appearance, easy to clean, you can install it yourself.